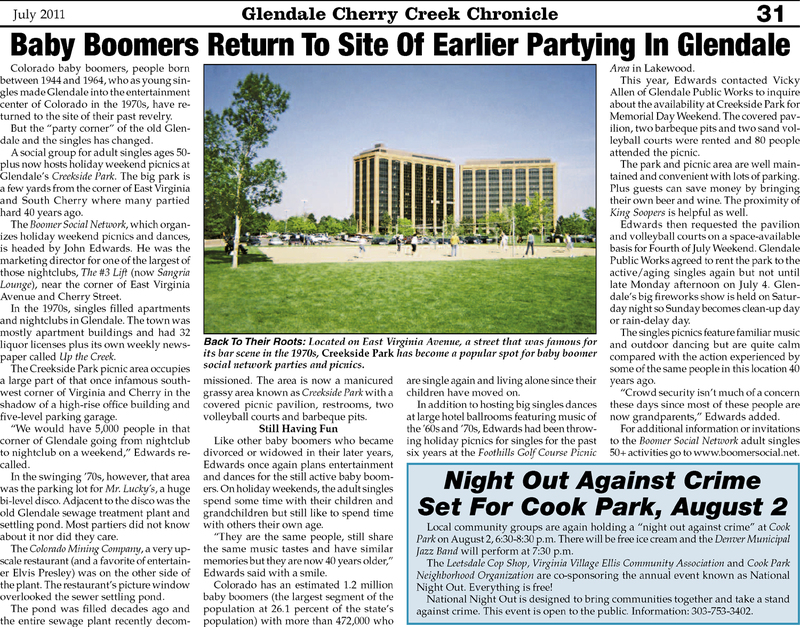 This Glendale Cherry Creek Chronicle news story describes our adult singles holiday weekend picnics held at Glendale's Creekside Park. Single Networks Are Drawing Boomers 45+ So Will They Ever Grow Up? Baby boomer singles are unmarried persons who were born during the demographic Post-World War II baby boom. The U.S. Census Bureau considers a baby boomer to be someone born during the demographic birth boom between 1946 and 1964, although the time frame is by no means exact. Baby boomers constitute over one-third of the Denver population and over half of them are single. Denver has been called the baby boomer singles capital of the United States. "They are everywhere," declared John Edwards an expert on baby boomer singles in Denver. Moreover, Edwards indicates they have no intention of looking or acting their age and these days don’t have to. Several decades ago a 50- or 60-year-old often looked the part of a grandmother or grandfather. Normally the hair was gray and/or receding, the skin was deeply lined and discolored and individuals often suffered physical infirmities such as arthritic damaged knees and hips that greatly limited their mobility. But no longer. With the help of hair transplants, laser peels for the skin, face lifts as well as botox and juvederm to alleviate the effect of gravity on the face, medical experts indicate that baby boomers can look 10 to 20 years younger than their actual age. Concerning physical infirmities, knee, hip and shoulder replacements and other orthopedic surgeries allow the baby boomers to stay active and engaged in sports for decades longer than their grandparents. But now cosmetic medicine has made baby boomer females look far younger than their age and the breakthrough of Viagra allows men to perform at a sexual level that was once limited to the young. In fact television ads for pills to cure "ED" which was once an almost taboo subject are now almost ubiquitous. A sexual arousal medicine for baby boomer women is even reportedly in the works. With an enormous number of baby boomers who are not married and the fact that those baby boomers looking for attractive mates no longer have to seek out much younger individuals to meet sexual needs, the advent of an active baby boomer singles scene has arrived. There are bars that cater to baby boomer singles such as North and Cherry Street Grill in Cherry Creek North, Elway’s in the Cherry Creek Shopping Center, Earl’s, Capital Grille in downtown Denver and Cool River in the Denver Tech Center. On any given Friday in the Valley those drinking establishments are packed with baby boomers looking for love. If a baby boomer singles bar isn’t your cup of tea, there is, of course, the Internet. You can go online and sign up for a baby boomer singles event for everything from cruise ship (zanza.com/Baby-Boomer-Cruises-Singles.htm) to mountain climbing (babyboomertrips.com/cat/Climbing). If a baby boomer finds meeting someone over a computer a bit impersonal there has arisen a whole cottage industry to arrange single events and dances for baby boomers. For a long time churches and public gathering places would have "sock hops" and other dance events for teenagers. 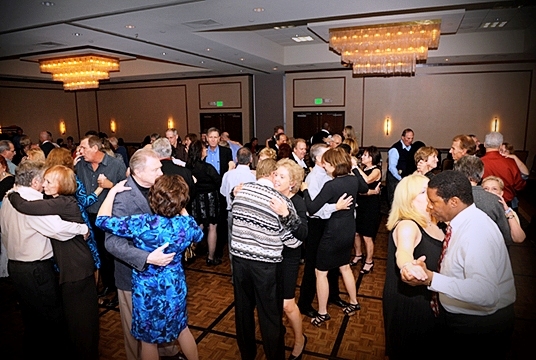 Now such events are a great deal less prevalent, and baby boomer singles have filled the void. Among the incredible number of private organizations that cater to baby boomer singles are singles networks such as Boomer Social Network organized by John Edwards, Denver Singles News and Spread the Word Network. Although not an event organizer, Aurora realtor Ron Tallman operates denversocial.com, a free informational Web site that lists more than 200 events for singles and couples in the Denver area. Eric Miller, a member of the baby boomer singles circuit and former San Diego resident, is a golf instructor who moved to Denver in July 2008. "There was no single scene for people over 40 in San Diego, and it was really hard to meet people," Miller said. "The Cherry Creek Valley has much better parties and groups that are more activity-based and fun. I like that it’s more of a social club and less of a situation where people are looking for a date." Although the singles networks are obviously geared toward single people, Edwards says that finding a mate is not necessarily the object of the game. Rather than being an expensive matchmaking service or paid membership club, the informal networks support each other. "I don’t want to have a dating club because if two people break up then I lose two great members," Edwards noted. "People just want to have a fun group to do fun activities with and not worry about anything but having a good time." Adds Amy Morrison, a member of the Mile High Spirited Singles group, "All the singles groups cross promote and work together. Different people own different dates and everyone attends each other’s events." While the Mile High Spirited Singles are known for their costume parties, Edwards, who is also the editor and publisher of Colorado Golfer newspaper, uses his contacts to secure golf course clubhouses that are unoccupied at night or in the winter. In the summer, Edwards hosts a weekly singles golf group at Kennedy Golf Course to teach women to play golf. The group plays the short par-3 courses in a team scramble format. Edwards says that his non-intimidating format has encouraged newcomers to keep playing the often demanding sport. "I’m part of John’s golf group and I’ve been attending his events for six years," said Jo Henderson. "His events are great because everyone has a great time and they are completely non-threatening. Everyone knows everyone and it’s very comfortable." Today’s baby boomer singles have created new and different social networks to continue their active lifestyles, especially in Colorado," Edwards explained. "The only thing that will slow some of them down is the grave." We all know that meeting new people can be very hard when you are in your 50's and '60's! Most of us did not expect to be single at this point of our lives. We did not expect divorce or the death of a spouse. Walking in alone to a singles party can be hard for most of us, but the thought of being alone the rest of your life can be down right scary! That's why you need to at least try every opportunity to attend a party! Every party will attract new people and you will at least have more of a chance of meeting someone special than sitting home alone! Enter the room with a smile. Don't be afraid to flirt. Compliment someone. Buy a drink for someone whom you wish to speak with. • If you really like someone, tell him or her. If there is no one you are attracted to in the room, at least have fun talking, socializing or dancing and enjoying having a night out instead of just sitting home alone! If someone asks you to dance, say yes! It is only for one dance and will make the other person feel good you said yes. No one enjoys being rejected! Don't worry about finding Mr. or Mrs. Right. Just have fun at the party meeting new people! Develop the habit of making friends everywhere you go, regardless of their attractiveness or gender. It's not only good practice, but it also opens up your world to many other possibilities. The new friend may invite you to a party where you will meet a single friend of theirs. Say hello to people you might have seen before at other singles events. You will make both of you feel more at ease at the event. If you do click with a "special someone" at the party, do follow-up with a phone call or an email. Let them know you are interested in them and would like to see them again! Not all people are mind-readers, let them know they mean something special to you! Many baby boomers already know a thing or two about marriage and are choosing not to tie the knot on their relationships—often because of money. U.S. Census Bureau data shows adults older than 50 are among the fastest growing segment of unmarried couples in the U.S.
Financial advisors say concerns about debt, benefits, taxes and cash flow are often the primary reasons they decide not to walk down the aisle. "The biggest considerations couples have in deciding whether or not to remarry usually center around their children and assets," says Molly McCormack, a director of individual advisory services at TIAA-CREF. If you're divorced and chose to remarry, you could lose alimony, pension and Social Security benefits from your former spouse. If you're widowed, you could also lose survivor's pension benefits, McCormack says. Some couples may also want to make sure inheritances go to their own children and don't get muddled. A partner may also be helping out adult children financially—by paying off student loans or cosigning on a mortgage—and the new partner doesn't want to take on that financial burden. In addition to mortgage, student loan and credit card debt, long-term care and medical debt are frequent concerns. Many higher income couples also don't want to face a bigger tax hit. Getting married could throw them into the highest tax bracket which would result in a much higher tax burden. But when two people live together, money matters can be murky. Financial advisors say it is important to make expectations clear. •Be specific with one another about expenses and who will pay for what. Determine what is yours, mine and ours. •Make sure assets are properly titled, including the home you live in and other property and/or small businesses. •Have a will, health care proxy, and power of attorney for finances. If you want your partner to have certain assets or to have control over your medical care or finances, if you are unable to do so, you must have in writing in the proper legal documents. "Make sure you communicate your wishes in your estate plan with your children too," says New York-based financial advisor Stacy Francis. "Avoid any surprises." Most important, whether you choose to say "I Do" or not, make a vow to always be financially independent. If you’re a single baby boomer looking for love, it can be all too easy to feel doubtful about your prospects. Aren’t the pickings slim in this age group? And isn’t the man-to-woman ratio abysmal? As tempting as it can be to buy these common beliefs, an array of surveys and studies say that, on the contrary, the dating scene never looked better than it does now for boomers. Check out these surprising statistics, and you’ll see what we mean. 1. There really are a lot of fish in the sea. According to the Census Bureau, 29 percent of adults age 45-59 are now single, compared with only 19 percent in 1980. 2. And those fish are having fun! 70 percent of single boomers say they date regularly. 4. You’re not necessarily craving the sound of wedding bells. Only 14 percent of boomer women and 22 percent of boomer men said their most important reason for dating was to find someone to live with or marry. 5. The man-to-woman ratio really isn’t that bad. There are 92 men for every 100 women for those aged 55 through 64. 6. May/December relationships are on the rise. Madonna is hardly the only gal living it up with a younger man; 34 percent of women ages 40-69 are "tadpoling," too. 7. Couplehood at this age ain’t just about companionship. When it comes to relationships, 84 percent of boomers rank physical attraction as being important or very important. 8. Older women really are comfortable in their own skins. 82 percent of boomer gals say they’re confident with their bodies, and 62 percent say they have a good sense of what satisfies their desires — which is way better than how Gen X-ers (52 percent) and Gen Y-ers (38 percent) feel. 9. Think finding love at your age is hopeless? Hardly! 75 percent of women and 81 percent of men in their 50s and older experience a serious, exclusive relationship after a divorce. So if that’s what you’re looking for, get on out there and you may find The One sooner than you think!